Bhikkhuni Canda was born Lucie Stephens in Chesterfield, England, in 1975. She came into contact with the Buddha's teachings in India in 1996 at the age of twenty, through the Vipassana tradition as taught by S.N. Goenka. During her first retreat she decided to devote the rest of her life to ending suffering through practising the Buddha's teachings. For the next seven years she meditated and gave service on numerous retreats, mostly in India and Nepal, as her aspiration to renounce lay-life intensified. However, ordination opportunities for women were so rare that she was unable to find any suitable monastery. Eventually, while undertaking an Ayurvedic Medicine degree in London, she heard about a promising monastery in rural Burma called Thephyu Tawya, and took temporary ordination there with Sayadaw U Pannyajota at the next opportunity. 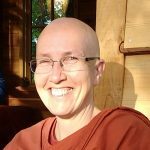 In 2006, after graduating, she returned to ordain for the long-term, and spent the next four years in intensive meditation and service under Sayadaw's guidance. During this time Ven Canda also encountered the Thai Forest Tradition through Ajahn Mahaboowa in Thailand, and became increasingly drawn to samatha practice as a means to develop deeper insight. By 2010 the ascetic lifestyle, climate and diet in Burma had taken its toll on Ven Canda's health, leading to a return to the West. This happily coincided with the chance discovery of Ajahn Brahm's teachings. His emphasis on love, kindness and letting go resonated so deeply and immediately that learning directly from him became a new goal. After 2 years as a wandering nun in Europe Ven Canda finally had the opportunity to travel to Australia and has been living there since 2012. She joined the Dhammasara community in Perth and took Bhikkhuni ordination in April 2014, with Ayya Santini as preceptor (pictured above to the left of Ajahn Brahm). In October 2015 Ajahn Brahm asked Ven Canda to take steps towards establishing a monastery in UK, to increase equality in practice and ordination opportunities for women. She is currently practicing wherever support is available, with a view to settling in England when conditions are ripe. 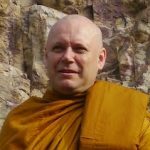 Ajahn Brahmavamso Mahathera (Ajahn Brahm) was born Peter Betts in London, England, on 7th August 1951. He considered himself a Buddhist at the age of 16. He came from a working-class background but won a scholarship to study Theoretical Physics at Cambridge University in the late 1960's. After graduating from Cambridge he taught in a school for one year before travelling to Thailand to train as a monk with Ajahn Chah Bodhinyana Mahathera. Whilst still in his years as a junior monk, he was asked to undertake the compilation of an English-language guide to the Buddhist monastic code (the Vinaya), which later became the basis for monastic discipline in many Theravada monasteries in Western countries. After practising for nine years as a monk in Thailand, he was sent to Perth by Ajahn Chah in 1983, in response to an invitation from the Buddhist Society of Western Australia, to assist Ajahn Jagaro in teaching duties. Initially they lived in an old house in the suburbs of Northern Perth and in late 1983 purchased 97 acres of rural forested land in the hills of Serpentine, south of Perth. This land was to become Bodhinyana Monastery- the first dedicated Theravada Buddhist monastery in the Southern Hemisphere. Initially there were no buildings on the land, and little funding, so the monks themselves began building. Ajahn Brahm learnt plumbing and brick-laying and built many of the current buildings, including the meditation hall, himself. In 1994, Ajahn Jagaro took sabbatical leave from Western Australia and disrobed a year later, abruptly leaving Ajahn Brahm in charge. Ajahn Brahm took on the role with gusto and was soon being invited to provide his profound, uplifting and humorous teachings in other parts of Australia and South-East Asia. In October 2004, Ajahn Brahm was awarded the John Curtin Medal for his vision, leadership and service to the Australian community by Curtin University, and has convened at many Global Buddhist Conferences (the most recent one in Perth, 2015). Currently Ajahn Brahm is Abbot of Bodhinyana, Spiritual Director of the Buddhist Society of Western Australia, Spiritual Adviser to the Buddhist Society of Victoria, Spiritual Adviser to the Buddhist Society of South Australia, Spiritual Director of Bodhinyana Singapore, and most recently Spiritual Adviser to Anukampa Bhikkhuni Project, in the UK. He is also working with monks and nuns of all Buddhist traditions to establish and develop the Australian Sangha Association. Ajahn Brahm has written several books, including the best-seller Opening the Door of Your Heart (published in US as 'Who Ordered This Truckload of Dung? '); Simply This Moment; Mindfulness, Bliss and Beyond; The Art of Disappearing and Don't Worry Be Grumpy. Hundreds of Ajahn Brahm's Dhamma talks are available for free download in both digital audio and video format. Warm and accessible, they are downloaded millions of times a year and barely a second passes when there isn't someone, somewhere in the world listening to a talk by Ajahn Brahm! Ajahn Brahm has also been influential in establishing Dhammasara Nuns' Monastery at Gidgegannup in the hills north-east of Perth to be a wholly independent monastery for nuns and in October 2009 facilitated Bhikkhuni ordinations there. 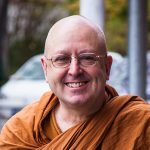 Despite controversy around the ordinations, Ajahn Brahm fearlessly continues to champion gender equality in Buddhism. Ajahn Brahmali was born in Norway in 1964. He first became interested in Buddhism and meditation in his early 20s after a visit to Japan. He completed Masters degrees in engineering and finance, before renouncing the world of industry and commerce to ordain as a bhikkhu with Ajahn Brahm as his preceptor in 1996. Apart from having been responsible for the building work at Bodhinyana Monastery, Ajahn Brahmali also teaches the monastic rules (the Vinaya) and gives Pali classes (the language of the texts). Ajahn Brahmali's clear and thoughtful talks make the teachings of the Buddha accessible to all and are very popular downloads on the BSWA website. He teaches regularly at BSWA and in a number of countries outside Australia. Ajahn Brahmali has also published a number of articles on important points of the Dhamma. Venerable Hasapanna was born in Ipoh, Malaysia in 1960. During her days as a lay person she and her family generously supported Ajahn Sujato when he was practicing in Ipoh. The main influence in Venerble Hasapanna's spiritual development is the monastic lifestyle of the forest tradition. 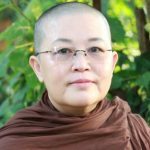 When Venerable Hasapanna had developed enough courage and inspiration to become a nun, Ajahn Sujato pointed her to join Dhammasara Nuns Monastery. She joined Dhammasara in 2002, beginning her monastic training as an Anagarika (trainee nun keeping 8 precepts). She then ordained as a Ten Precept Nun with Ajahn Vayama as her teacher. She subsequently ordained as a Bhikkhuni in 2009 with Ayya Tathaaloka as her preceptor in a ceremony at Bodhinyana Monastery, WA, Australia. Currently, Venerable Hasapanna is the Abbot of Dhammasara Nuns Monastery and Assistant Spiritual Director of The Buddhist Society of WA. She is heavily involved in teaching and training nuns, anagarikas and lay people. 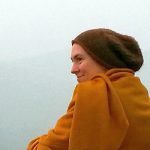 Ayya Anandabodhi, originally from Wales, has lived as a Buddhist nun in the Forest Tradition since 1992, spending 17 years in Amaravati and Chithurst monasteries before moving to the United States in 2009 to help establish Aloka Vihara, a Buddhist monastery for women. In 2011 she took full ordination as a bhikkhuni, with Ayya Tathaaloka as her preceptor, joining the growing number of women who are reclaiming this lineage given by the Buddha. Her practice combines meditation in nature, studying the early Buddhist suttas and living in community. She teaches Dhamma on a regular basis in her local area and occasionally further afield. Ayya Santacitta was born in Austria and has a multifaceted background in hotel management, cultural anthropology and avant-garde dance theatre. Her first teacher was Ajahn Buddhadasa, who sparked her interest in Buddhist monastic life. 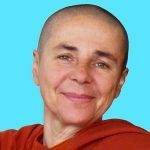 She has practiced meditation for over 25 years and trained as a nun in both the East and West since 1993, primarily in the lineage of Ajahn Chah. Since meeting Shechen Rabjam Rinpoche in 2002, she also integrates Dzogchen teachings into her practice. Ayya Santacitta is co-founder of Aloka Vihara, where she resides since 2009 and received bhikkhuni ordination in 2011. She is particularly interested in learning from nature and bringing faith traditions to the climate movement. (b) furthering the education of the public in the teachings and practices of the Buddha by organising educational activities. The charity is run entirely by a tenacious team of volunteers committed to realising the ambition of establishing a bhikkhuni monastery in the UK and creating a supportive space for Dhamma practice for monastics and laypeople alike. Anukampa Bhikkhuni Project has a Safeguarding Children and Vulnerable Adults policy and associated procedures. If you would like a copy, please send your request through our general enquires contact form, putting 'Safeguarding' in the subject line. The four new bhikkhunis, Vens Gotami, Upekkha, Canda and Karunika.